There’s a new candidate for the next tallest building in the region, to be located on a multimillion riverside development in Phnom Penh, Realestate.com.kh reported. Local authorities including the Department of Land Management Urban Planning and Construction, and the Phnom Penh government recently approved a revised plan to erect the building by 2019. The mixed-use building will be called the Thai Boon Roong Twin Tower Trade Center and it will have commercial, office, retail and hospitality components. It will be built under Cambodian company Thai Boon Roong Co and Chinese firm Kia Nip Group. According to the Realestate.com.kh, the 133-storey tower will become the tallest skyscraper in Southeast Asia when completed, surpassing the height of the Petronas Twin Towers (88 levels) in Kuala Lumpur and Vietnam’s Keangnam Hanoi Landmark Tower (77 levels). Other building projects or proposals have been announced to claim the title for the region’s tallest structure, among them Landmark 81 in Ho Chi Minh City and the Grand Rama 9’s Super Tower in Bangkok. This is not the only development in Phnom Penh that’s gunning for the recognition. 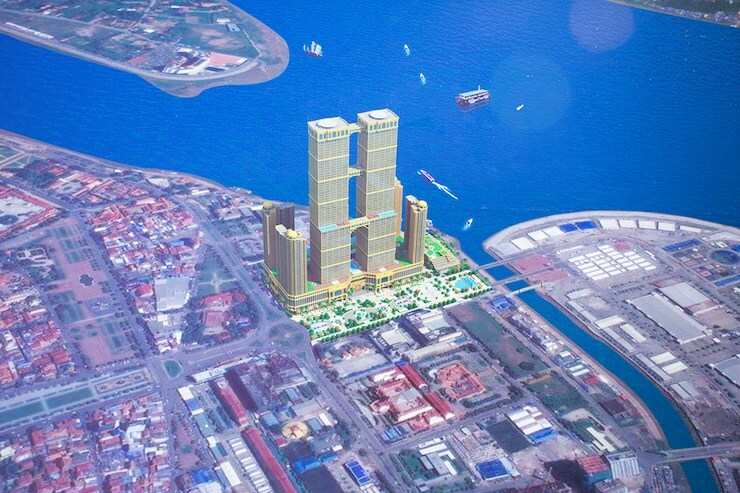 The Phnom Penh Post reported in 2013 that the multimillion Diamond Island project was to include a 555-metre skyscraper from the Overseas Cambodian Investment Corporation (OCIC), but the project has stalled for the time being. With several high-rise towers and condominiums under construction in the Cambodian capital, building safety issues have become a priority for many developers. Taiwanese firm TC Royal Manor Co Ltd, developer of the mixed-use high-rise TK Royal One on Russian Boulevard, has been noted for its safety regulations at its construction site.